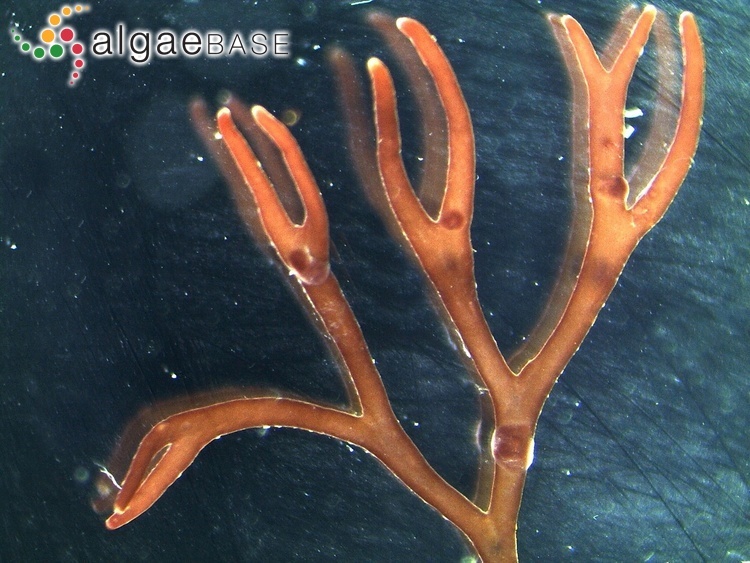 Gymnogongrus giffithisiae, upper subtidal, RÃ­a de Ferrol, Galicia, Spain, 2004, Ignacio BÃ¡rbara" . Ignacio Bárbara. © Igancio Bárbara (barbara@udc.es). 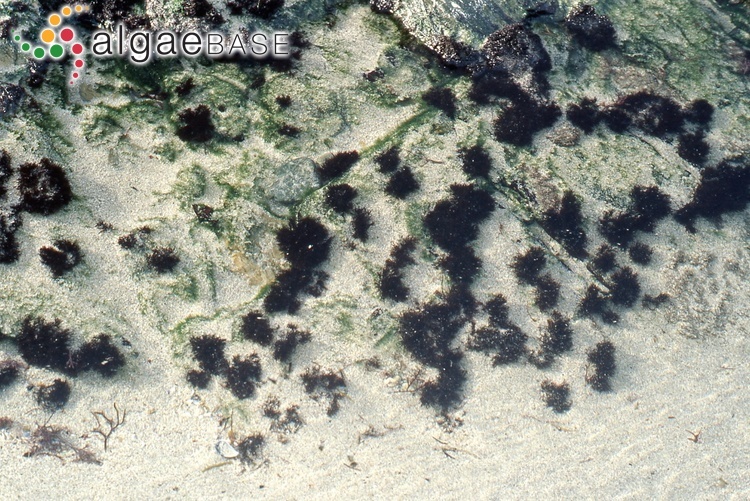 Gymnogongrus giffithisiae, lower intertidal, RÃ­a de Muros, Galicia, Spain, 2003, Ignacio BÃ¡rbara. Ignacio Bárbara. © Igancio Bárbara (barbara@udc.es). 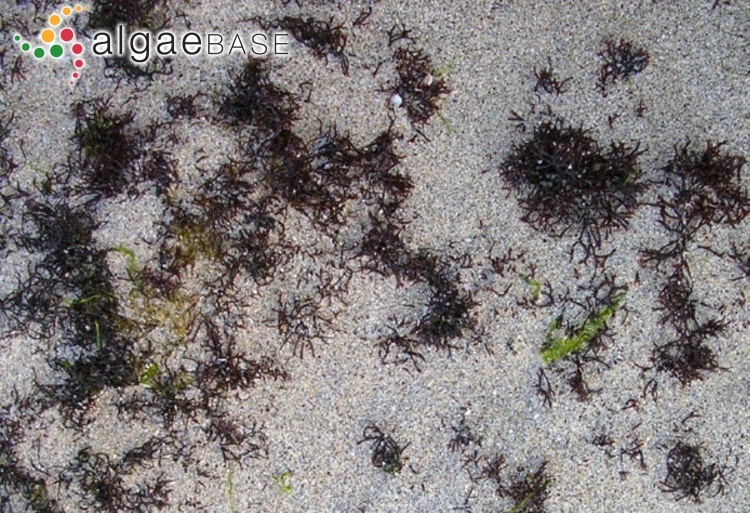 Gymnogongrus giffithisiae, lower intertidal with Rhodothamniella floridula, RÃ­a de Muros, Galicia, Spain, 2006, Ignacio BÃ¡rbara . Ignacio Bárbara. © Igancio Bárbara (barbara@udc.es). 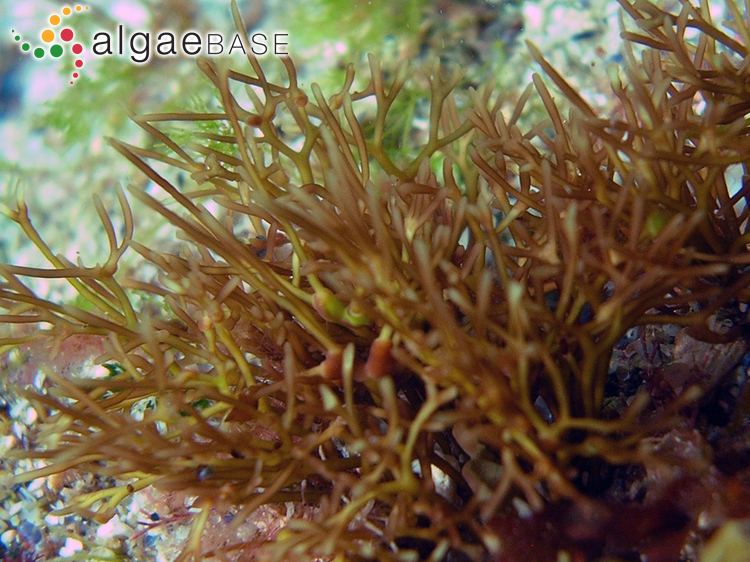 Gymnogongrus giffithisiae, lower intertidal with Rhodothamniella floridula, RÃ­a de Muros, Galicia, Spain, 2006, Ignacio BÃ¡rbara. Ignacio Bárbara. © Igancio Bárbara (barbara@udc.es). Gymnogongrus griffithsiae. Diameter of carpotetrasporangial outgrowths approx. 300 µm. Broadhaven, Pembrokeshire. 08 Jan 2012. Francis Bunker. © Francis Bunker. Gymnogongrus griffithsiae. Length approx. 3.5 cm. Broadhaven, Pembrokeshire. 08 Jan 2012. Francis Bunker. © Francis Bunker. This is the type species (holotype) of the genus Gymnogongrus. Type locality: Chit Rocks, Sidmouth, Devon, England (Turner 1802: pl. 37). Lectotype: BM-K (Turner 1802: pl. 37). Notes: Devon (probably near Chit Rock, Sidmouth (Dixon & Irvine 1977: 219). Named for Amelia Warren Griffiths (1768-1858), collector from Torquay, Devon, England. According to Lawson & John (1987) this species is "known as far south as Mauritanie (see Lawson & John, 1977). Cartilaginous, cylindrical to compressed, brow-red to blackish purple fronds, to 75 mm high, from an expanded discoid base. Repeatedly dichotomous, fastigiate, with rounded, somewhat flattened apices. Epilithic, littoral in pools and emergent, upper sublittoral; tolerant of sand cover (Dixon & Irvine 1977: 219). 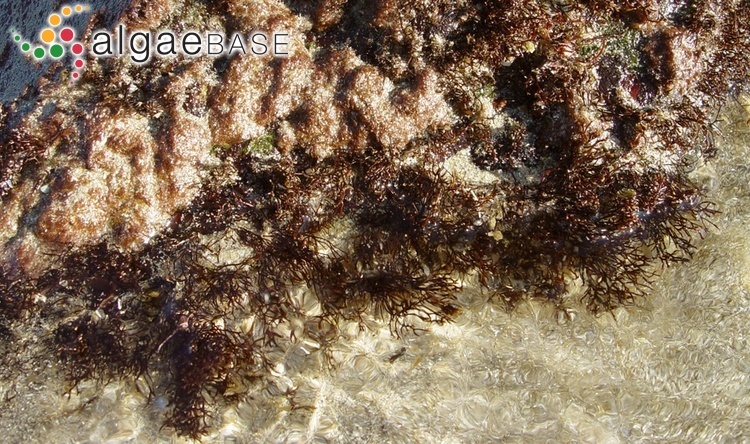 On sand-covered rocks, lower intertidal, rare, widely distributed. Polyides rotundus from which it many be distinguished by the presence of a rhizoidal base, narrower branching angles (i.e. less fan-shaped), and that the fronds are brownish when held up to the light. Masuda, M., Kogame, K. & Guiry, M.D. (1996). 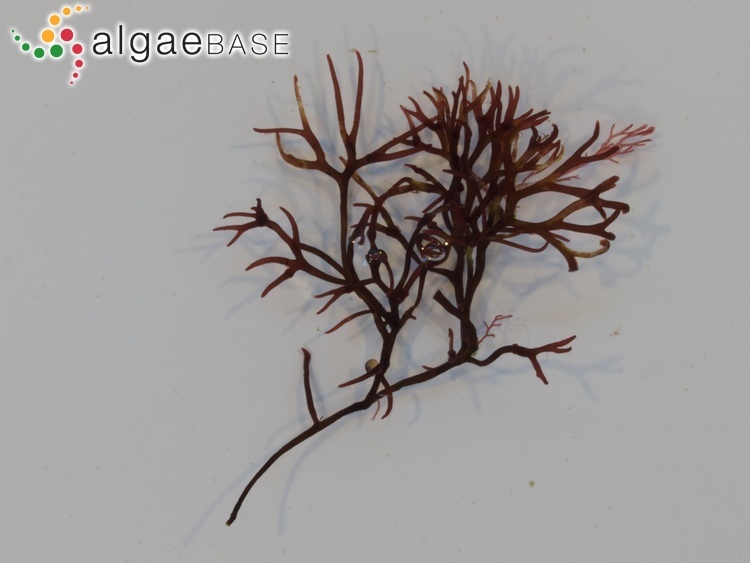 Life history of Gymnogongrus griffithsiae (Phyllophoraceae, Gigartinales) from Ireland: implications for life history interpretation in the Rhodophyta. Phycologia 35: 421-434, 39 figs, 1 table. Accesses: This record has been accessed by users 8606 times since it was created. Chemin, E. (1933). Sur la mode de reproduction de Gymnogongrus griffithsiae Mart. et de quelques espèces du même genre.. Bulletin de la Société Botanique de France 80: 755-770. Cordeiro-Marino, M. & Poza, A.C. (1981). Life history of Gymnogongrus griffithsiae (Turner) Martius (Phyllophoraceae, Gigartinales). Proceedings of the International Seaweed Symposium 10: 155-161. Gregory, B.D. (1934). On the life history of Gymnogongrus griffithsiae Mart. and Ahnfeltia plicata Fries.. Journal of the Linnean Society of London, Botany 49: 531-551. Kapraun, D.F., Dutcher, J.A., Bird, K.T. & Capecchi, M.F. (1993). 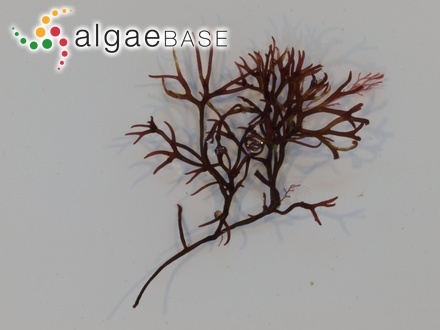 Nuclear genome characterization and carrageenan analysis of Gymnogongrus griffithsiae (Rhodophyta) from North Carolina. Journal of Applied Phycology 5: 99-107.